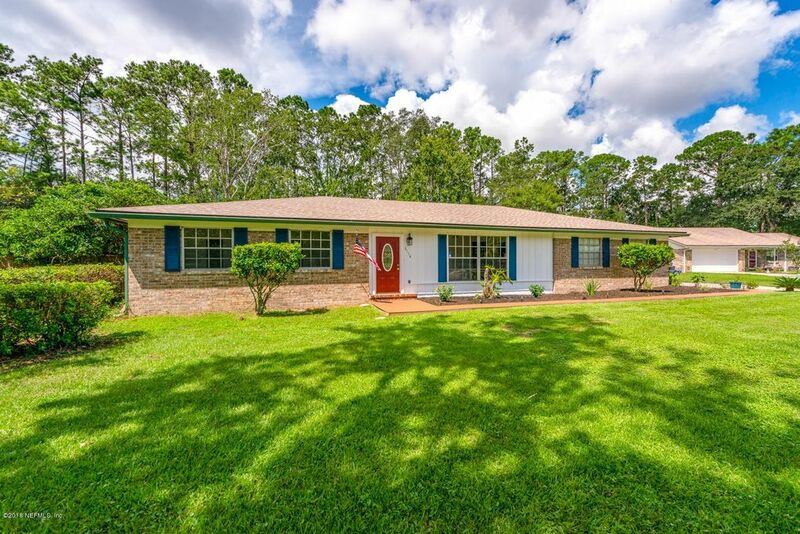 Move in ready 3 bedroom pool home situated on big private lot! It is only about 10 miles from NAS Jax and less than 3 miles from the new Costco! Come check this one out with newer roof (2016), freshly painted, wall to wall carpet (new), ceramic tile & wood laminate floors throughout! Kitchen has been updated over the years w/new cabinetry & Corian countertops. Nice fireplace in family room that overlooks large backyard with room for lots of toys while you splash around in your pool!Oversized storage shed which has room for riding lawn mover if you have one! Located on cul de sac , side entry garage, one yr home warranty being offered. The front room has a closet and could be used as another living area or guest room w/small modification. Don't let this one slip away!Great buy for the area! Directions: From Rampart Rd, head west on Collins Rd, t/l (south) on Cholo Trail, t/r on Cayuga Trl N, follow road as it becomes West - house will be on the corner of N and W - on cul de sac.